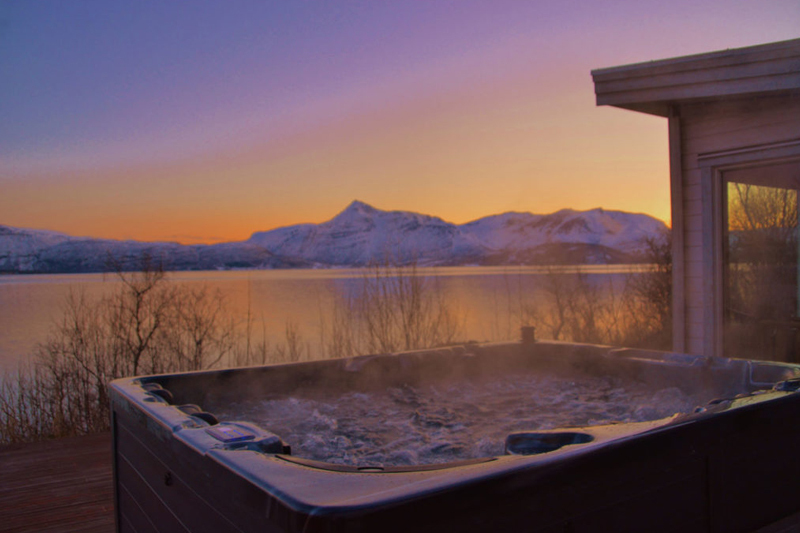 At Magnetic North Travel we believe that a hot tub with soothing views across Lapland’s frozen lakes or Iceland’s mesmerising black lava fields is a great reason to travel. Not only have the Nordic countries perfected the art of a well-being focussed work-life balance they also emphasise the stress-defying power of nature. Combining wilderness and well-being spa-goers can expect a simplistic, yet soul-warming hot tub experience with stunning fjord, lake, ocean or forest views to add to the memory box. Since wellness, nature and well-being is very much a national institution up north, travellers will usually find both a sauna and hot tub. Interestingly, a hot tub is considered a lovely add-on in sauna-loving Scandinavia whereas it's the other way around in Canada! Again, with nature playing such an integral part in the northern spa experience you may find that most hot tubs are located outside. For this reason, we decided to feature our favourite outdoor hot tub experiences based on the view and overall nature experience. 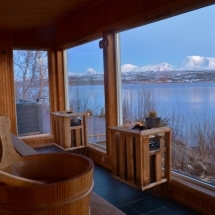 Conveniently located on the deck of Lyngen Lodge travellers don’t have to walk very far to reach the warming water. The sensation of gliding into the blubbering water feels especially rewarding after a day spent hiking or cross-country skiing. 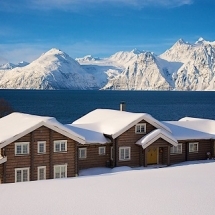 Nestled deep in the Lyngen Alps near Tromso, the grass-turfed boutique lodge offers dramatic fjordside views. During the summer you’ll overlook snow-capped mountains, lush fjords and pristine blue waters. In winter a thick layer of snow offers white hues against pastel-coloured skies. 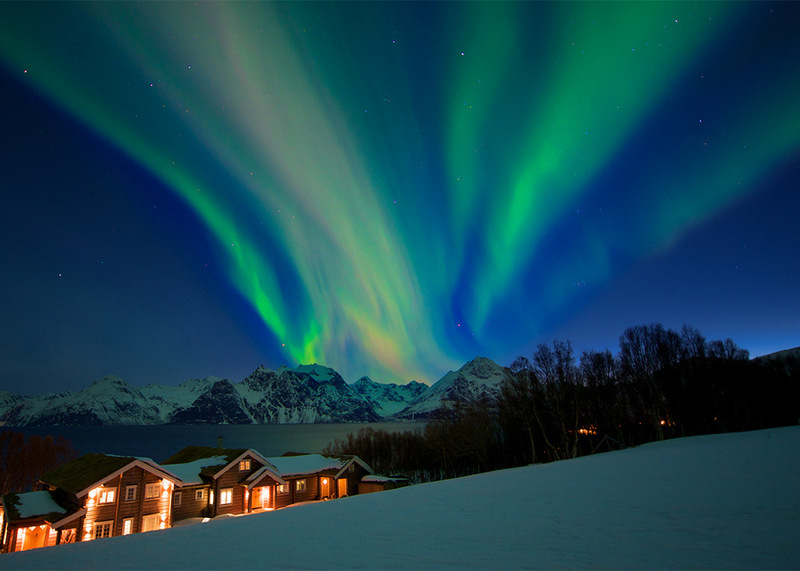 Due to the lack of light pollution, some lucky spa-goers might be able to see the Northern Lights in the sky above. 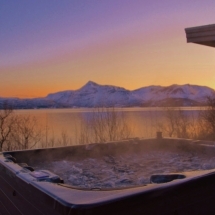 Since Lyngen Lodge’s activity programmer is very much about balancing between action and relaxation, we feel that the hot tub is an essential part of the luxurious experience on offer. If luxury, action and hot tub sound like a perfect plan to you we recommend checking this summer trip and/or this winter break. 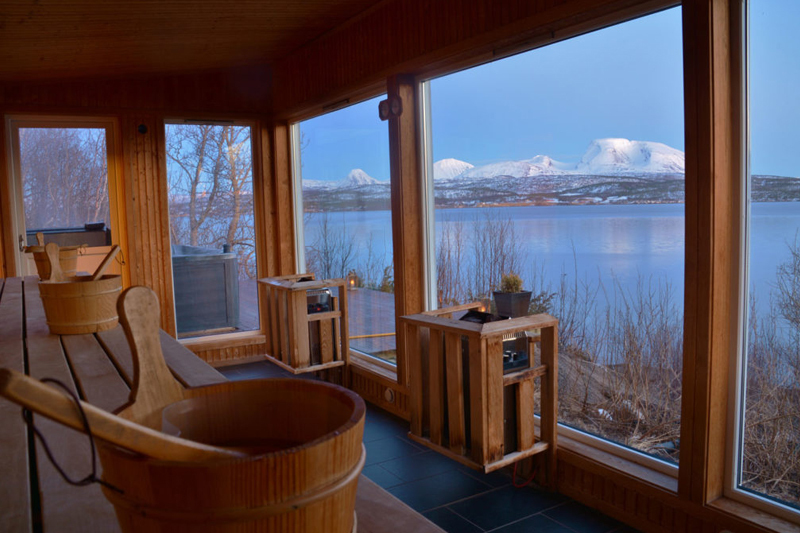 Malangen’s glass-fronted sauna and outdoor hot tub offer scenic views of the homonymous fjord. Adventurous guests can dip into the always refreshing and sometimes freezing cold fjord water just outside. Luckily, the walk back to the hot tub is a short one! 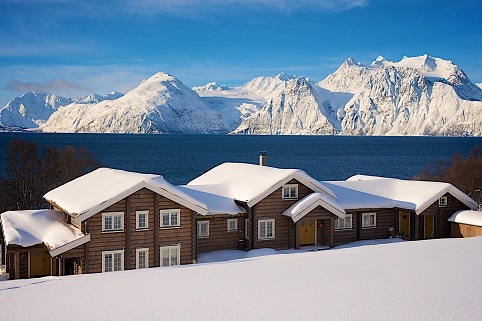 A trip Malangen Fjord transports guests into Arctic Norway’s stunning wilderness. While the hot tub takes care of the relaxation, nature caters for the drama. This is what romance is all about, right? Enjoy the unique atmosphere of where Norway’s triangular mountains meet the Arctic Sea. 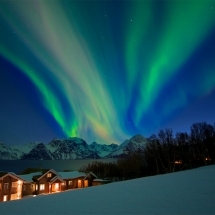 Sometimes, an extensive outdoor hot tub session which is especially popular amongst Northern Lights hunting honeymooners may even be rewarded with the appearance of the lime-coloured lights adorning Malangen’s skies during early September and late April. Winter honeymooners should definitely browse this itinerary. Inspired by Nordic tradition, the Fogo Island Inn rooftop sauna and hot tub have been designed by two Northern European architects, Sami Rintala and Dagur Eggertsson. 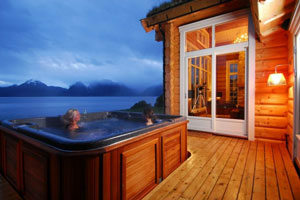 The two hot tubs are immersed in the wooden deck of the four-story hotel blending in seamlessly. 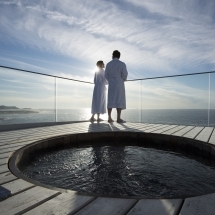 The hot tub and sauna are located at the right wing of the hotel offer breathtaking views across the tumultuous North Atlantic to the north and rugged coastal views to the south. 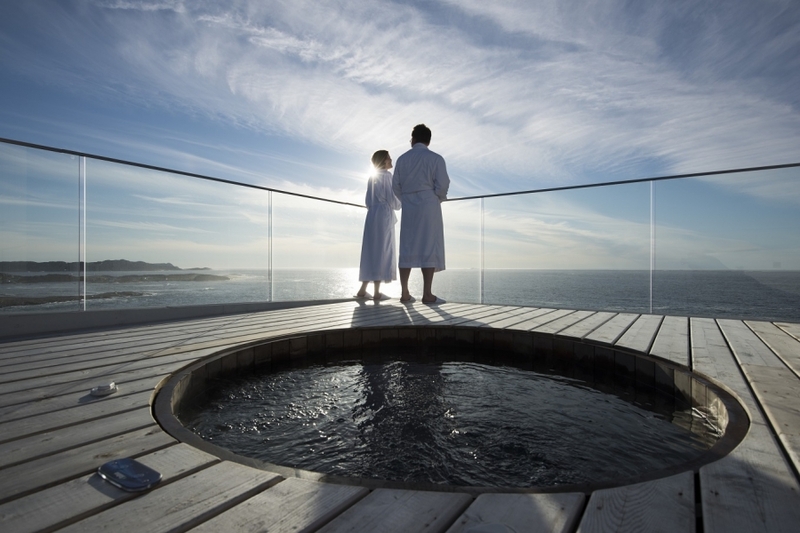 Since Fogo Island Inn prides itself on being located at one of the four corners of the globe the combination of exquisite views, thoughtful architecture and the authentic, luxurious ambience make this outdoor sauna experience truly unforgettable. Unbeknown to many, a stay at the award-winning Canadian eco-retreat only takes a 5-hour flight from London. If you're looking for a relaxing short break in an iconic design hotel we recommend taking a look at our Fogo Island short break. Unlike most hot tubs, the Secret Lagoon in Iceland isn’t fuelled by wood. 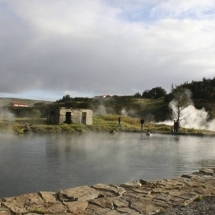 It’s powered by Iceland’s geothermal powers keeping the water temperature at a relaxing 38-40 degrees. Strictly speaking, the Secret Lagoon is more of a hot spring but considering that it has been used as a spa retreat since the 50’s we’re happy to pass it off as a particularly close to nature hot tub. Our personal Secret Lagoon highlight? The nearby geyser which erupts every five minutes. Being located in geothermal hotspot guests of the Secret Lagoon are surrounded by steaming air rising from the craggy, moss-covered rocks. It’s a truly mystical experience and the surroundings are sure going to let you unwind. 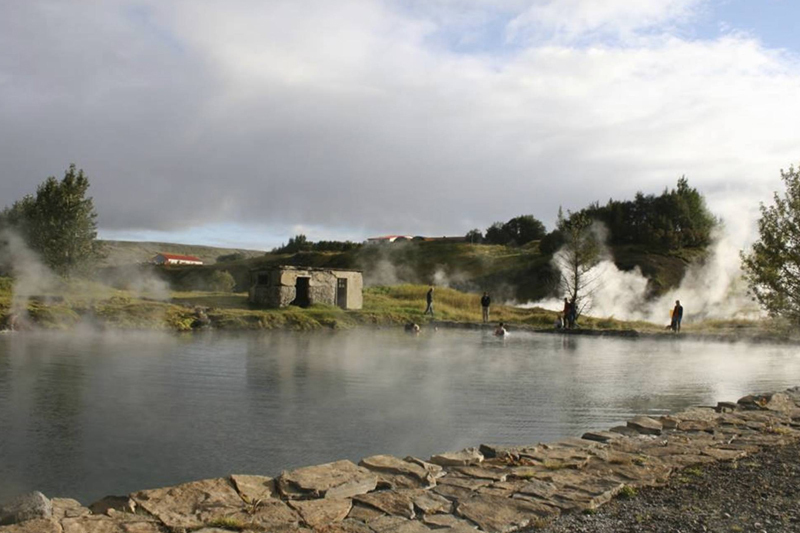 If you like to stick to the classic hot tub experience we can recommend Hotel Ranga whose hot tub overlooks lush Icelandic valleys, crisscrossed by small rivers. Just outside the luxurious Queen Suite romantic couples can enjoy the Finnish log cabin vibes amidst Lapland’s soothing forest views. 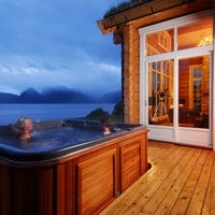 The hot tub, directly attached to the cosy cabin is sheltered and of course private. Finnish Lapland’s Boreal forest is a magical place especially during the winter months when the snow has settled in. There’s a unique calm only snow-clad pine trees seem to exude-it very much feels like an escape. Since winter in Finnish Lapland sees temperatures drop down to -30 degrees the hot tub is a welcome retreat after an exciting day out. This experience is best suited to honeymooners and romantic couples. Take a look if you're planning an escape! 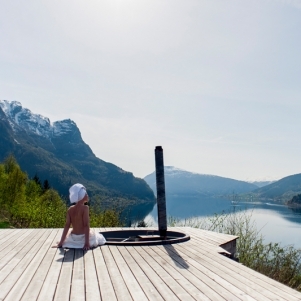 Immersed in a viewing platform nearby the boutique hotel Aurland 292, this hot tub is the best spot to end an exciting day out in the UNESCO-protected Aurlandfjord. Located deep in the Aurland valley, the lodge inspired by fjord Norway's fishermen's cabins is very much a summer destination. Expect stunning mountain views, the odd fly-fisher hoping for a lucky catch and every shade of green as nature is coming to its full bloom.